News / Transport / What next for Fishermans Bend? What next for Fishermans Bend? With the unveiling of the finalised Fishermans Bend framework and planning controls, aside from precinct plans, another major question remaining relating to the redevelopment zone is transport. 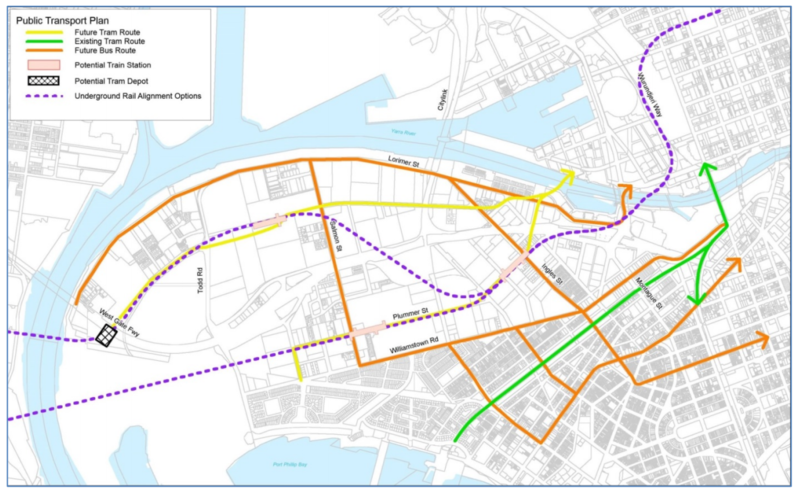 A tram extension over the Yarra from Collins Street in Victoria Harbour was identified as a medium-term priority project in the integrated transport plan and two alternative heavy-rail corridors were also identified. On trams, a single bridge which carries at least two routes across the Yarra and then splits to service the Lorimer-Employment precinct north of the West Gate Freeway and Wirraway-Sandridge to the south of the West Gate Freeway will go a long way to connecting Fishermans Bend to the rest of the CBD and Docklands. However, the real city-changing transport infrastructure is the second metro tunnel that will draw south-west Melbourne much closer to the city and also increase capacity on the Footscray-Newport and City-Clifton Hill railway lines. The integrated transport plan showed two alternative routes. According to the maps in the plan, both routes share the same station in Sandridge - the Fishermans Bend precinct located to the south of the West Gate Freeway opposite Yarra's Edge in Docklands - and one heads under Plummer St with a station in Wirraway and the other heads north under the West Gate Freeway into the employment precinct. This is the limit of publicly available information on the project and since the integrated transport plan was unveiled with the draft framework plane late in 2017, we've not heard boo about it since. Will the 2020s and 2030s be the new golden age of railway building? The Premier has stated on many occasions that he won't be in the job when the Suburban Rail Loop is completed but he'll be the one who starts it. The real question is, will he be the premier which starts Melbourne Metro 2 as well? The Federal Government under former Prime Minister appeared to force the state government's hand on the Melbourne Airport Rail Link earlier this year and not more than a month ago, the state government stunned many when it announced its Suburban Rail Loop election policy. We know the Melbourne Metro 2, Melbourne Airport Rail Link and Suburban Rail Loop will be very expensive projects with business case development underway for the Melbourne Airport Rail Link and Infrastructure Victoria has provided a preliminary assessment of Melbourne Metro 2. The Suburban Rail Loop's business case will start in 2019 if the Andrews Government is re-elected. There's still a way to go with Fishermans Bend - the detailed precinct plans - and the framework documents that were published last Friday contain precinct breakdowns which project population, jobs and open space over two timeframes. Starting with 2018 as a base case, the projections are 2025 and 2050. Today, the number of jobs in Sandridge stands at 5,200 and in 7 short years that number is expected to double to 11,080 before ultimately heading toward 26,000 jobs by 2050. All three other precincts (excluding the employment precinct) are all similarly projected to either double or triple, albeit from much smaller collective bases. It's conceivable the tram network could be extended into the redevelopment zone within the same time period as the next state government term. The jobs and population predictions for Fishermans Bend precincts by 2025, on the face of it, pass the pub test when it comes to matching them with new tram capacity, but on the road to the 2050 levels, that train line will be needed. Finance aside, labour (and specifically, the cost of labour) will be an issue with many rail projects underway at the same time in Melbourne, notwithstanding NSW's very large pipeline of work, WA's ongoing Metronet program and Brisbane's set to get in on the underground rail action with its Cross River Rail project. Another pre-election announcement appears to assuage the labour concerns with Holmesglen Institute selected as the site for the country's first tunneling school; likewise the Andrews Government's announcement on select TAFE courses attracting zero fees will also help bolster the workforce required to construct 3 major rail projects at one time. The Melbourne Airport Rail Link and the Suburban Rail Loop have 2022 as their shovels-in-ground dates and the metro tunnel now under construction is not scheduled to complete until 2025 - from start to end, that's roughly a 10 year project. Should Metro 2 not aim to start in 2022 as well? By the time it would be completed - circa 2032, Fishermans Bend will be hitting its stride if the population and job numbers are to be believed. I strongly support the new tram route Wirrayway-Sandridge up Plummer Street over the Yarra to CBD. This connects Garden City and Fishermans bend to the CBD. This will be fantastic!! They should also consider a bridge between Yarraville and Fisherman's Bend for pedestrians, cyclists and public transport, much like the Eleanor Schonell Bridge to UQ in Brisbane. The current situation with just the West Gate Bridge as the only connection between the two sites is already ridiculous, but it will descend into farcical if there's really 80k jobs and 80k residents there and yet no easy connections to a suburb just 500m away. Credit to Richard Wynne for adding some rigour to Mathew Guy's waving of the rezoning wand over Fisherman's Bend. Justin Madden, now of ARUP, made the point that the area requires a $10B transport spend in order for the development potential of the sites to be realised. Docklands in London required the private sector to deliver a transport link (light rail) and so did Darling Harbour in Sydney with its wholly inadequate monorail. I'll be interested to see what is proposed here and who is expected to pay for it.